Public Procurement is the procurement of goods and services on behalf of a public authority, such as a government agency or government owned public sector organization etc. To prevent fraud, waste, corruption, or local protectionism, the law of most countries regulates government procurement more or less closely. It usually requires the procuring authority to issue public tenders if the value of the procurement exceeds a certain threshold. The laws are in place to improve governance, management, transparency, accountability and quality of public procurement of goods, works and services. 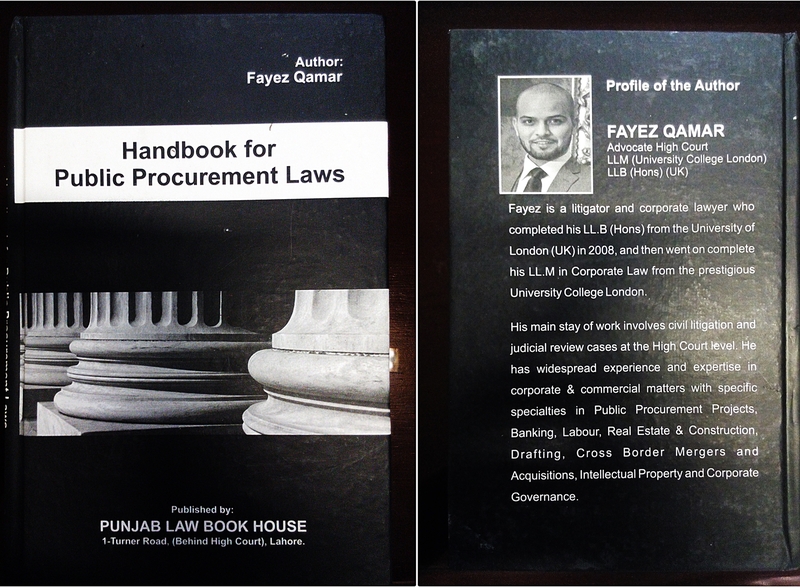 The Public Procurement regime in Pakistan, like in most developing countries, has been enacted and (understandably so) needs improvement. Laws, rules and regulations, although in place, are inadequately implemented or enforced. If you are a lawyer/barrister in general practice, a sole practitioner, a procurement law specialist or a businessman, I am able to identify with you and your needs in the practice of this area of law. The courts have had limited opportunity to adjudicate over the Public Procurement Regulatory Authority (PPRA) Ordinance and more importantly over the Procurement Rules 2004. Queries remain unanswered and a cloud of uncertainty prevails (for now). In seeking answers to the unaddressed issues in the public procurement regime, my research has embraced the jurisdictions of India and UK. It is hoped that the book (along with any future editions) would meet the needs of most and be able to serve the legal fraternity in a better away. The writer is a litigator and corporate lawyer who completed his LL.M from the prestigious University College London. He is also a part-time lecturer at Pakistan College of Law.